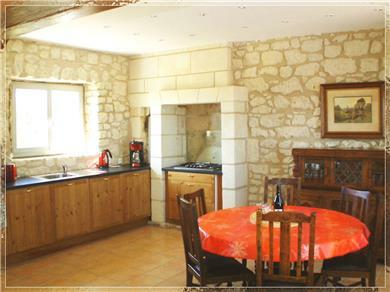 Traditional tuffeau-stone farmhouse with heated 12 x 6 meter swimming pool & fenced garden with panoramic views to the west. 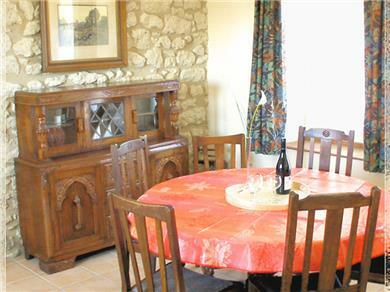 Only 7 miles from Saumur while situated in calm rural location. Good cycling and walking area with quiet country lanes and national forest only 500 metres away. Riverside water parks with beaches within easy reach. Nearby town 1 mile away with small supermarket, bakers, butcher, bars, hairdressers, garage etc. Set in the heart of the Loire valley wine area with appellations of Bourgeuil, Chinon, Champigny & Saumur a stoneâ€™s throw away . 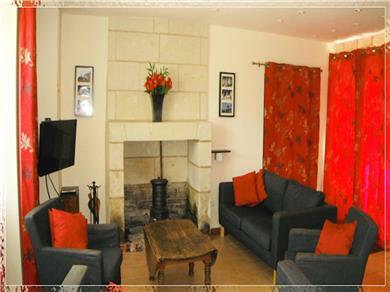 La Grange is a 18th century cottage recently refurbished to a very high standard. It is completely separate and has its own private access. Downstairs: Fully equipped kitchen with lovely westerly views over its own exclusive enclosed private garden and patio area. Dining area overlooks the pool in the sheltered courtyard. 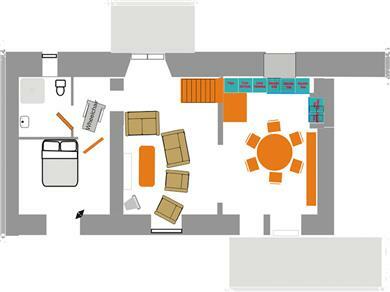 Open plan salon with comfortable seating for 6 and has UK Freesat TV & DVD player. From salon french doors lead onto garden and terrace. There is WIFI throughout the gÃ®te. 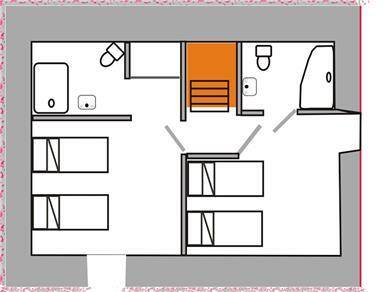 The ground floor bedroom & shower-room have been designed to be wheelchair friendly (exact details provided on website). 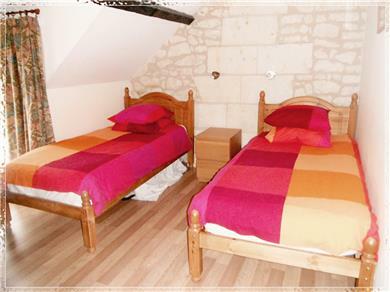 Upstairs: 2 en-suite twin bedrooms - one with bath, one with shower. 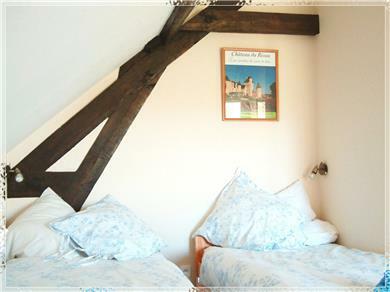 Perfect for families or friends travelling together as each bedroom has itâ€™s own facilities and the upstairs bedrooms are not directly over the downstairs master suite. La Grange Â Property Summary Â 18th century farm. 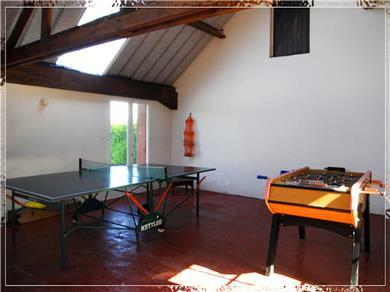 Sleeps 6.Â Â 3 en-suite bedrooms, 12 x 6 m heated pool. 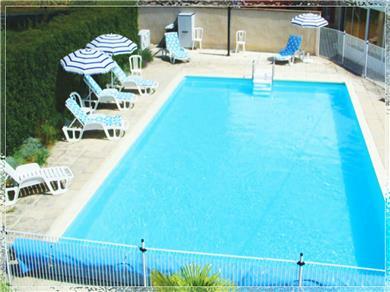 7 miles from Saumur in stunning Loire Valley settihg. 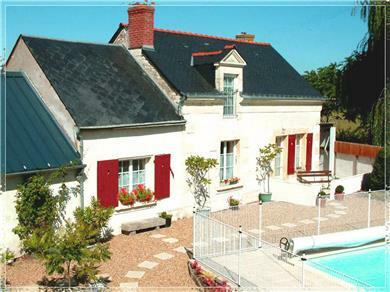 Â Property Description Â La Grange is a recently restored, traditional tuffeau-stone farmhouse set in the rolling countryside that borders the Loire. It features a magnificent heated 12 x 6 meter swimming pool & has its own fenced garden and enjoys eye-watering panoramic views to the west. 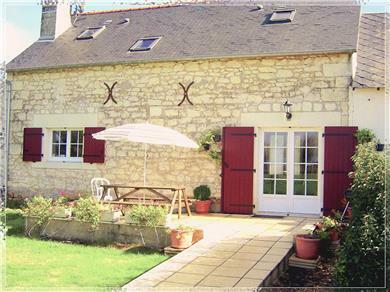 While only 7 miles from the historic heart of the bustling market town of Saumur, the farmhouse is nonetheless located in calm and idyllic rural location. The immediate area surrounding La Grange is notable for good cycling and walking with quiet country lanes and an ancient national forest that begins only a short stroll away. Riverside water parks with beaches are within easy reach. The nearby town, only a mile away boasts a small supermarket, two bakers, bars, hairdressers, and a garage. In the world famous Loire wine area that surrounds La Grange are found the appellations of Bourgeuil, Chinon, Champigny & Saumur. The dry reds sparkling whites, fruity white wines and dessert wines provide for all palates and suit any occasion. Â One arrives at La Grange sweeping through a convenient system of automatic gates and then alongside the large enclosed park area that lies to the rear of the property. After parking in the bay provided next to a fenced garden that is exclusive to La Grange and which provides panoramic views to the west, guests make their way through french doors that lead from a large sun-drenched patio and on into the ground floor of La Grange. Before them, they will note the refreshing tiled interior of a large salon with seating for six and still sporting its original open fireplace. Here, in the salon, a discrete television unit supplies UK freesat TV. There is also a DVD player available. To the left, in another large, open-plan area, is the kitchen featuring a large circular table that comfortably seats eight. 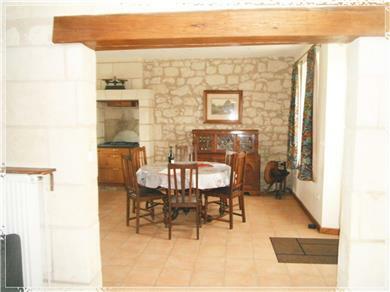 This lovely room displays all the charm of a traditional farmhouse kitchen while at the same time benefitting from the convenience of modern appliances: There is a dishwasher, a five-burner hob, a fridge/freezer, microwave and everything that could facilitate cooking for a family or group of friends interested in exploring French cuisine. Â To the right of the salon, as you enter La Grange, is a small, wide corridor leading to a double bedroom featuring a king-sized bed that overlooks the sunny pool area and courtyard. 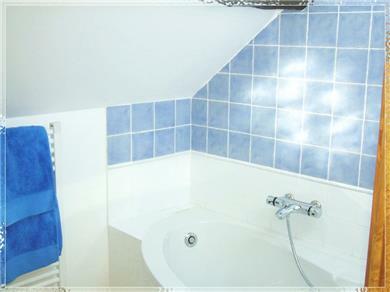 Adjoining the bedroom is a spacious walk-in shower-room with washbasin and WC. This self-contained en-suite has been designed with wheelchair access in mind and has frequently enabled carers and their charges to enjoy a well-earned break. Â To the left as you enter the Grange to the rear of the salon a flight of oak stairs leads up to the first floor of the building. Turning left at the top of the stairs brings one to the â€˜Blue roomâ€™ â€“ a twin room that has views over fields at the back and which boasts an en-suite shower/bathroom/WC. Â To the right is the â€˜Green roomâ€™, another twin room with, in this case, a shower room with WC. This room has wonderful views over the pool and courtyard and over nearby poplar woodland where the liquid cries of golden orioles can often be heard. Â On returning downstairs and venturing out of the kitchen door that gives on to the side of La Grange that faces the pool, a sheltered, half-walled terrace can be found. 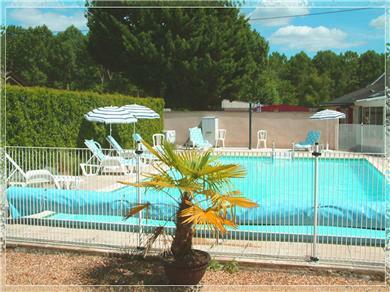 This is the perfect place to acquire the mandatory tan while at the same time keeping an eye on those in the pool. Â Â Wheel chair friendly features Â The ground floor of La Grange has been designed with special attention to accessibility for wheelchair users. Entrance to the property is by way of gentle ramps and the ground floor of the property is all at one level with no steps. There is a specially designed en-suite section set behind the salon. Large doorways and turning areas are available throughout. 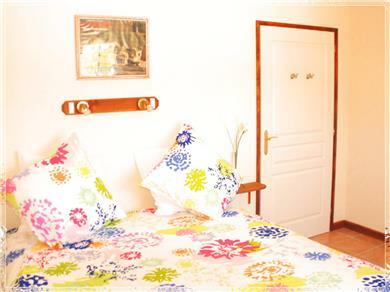 The bedroom features a king-sized double bed and has a view over the courtyard where the pool is situated. 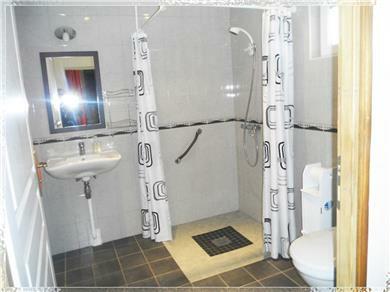 Â The en-suite shower-room/ WC has been specially equipped for use by wheelchair users.